Did you know that besides books, magazines, and newspapers, the Amazon Kindle can also subscribe to blogs? From some of the most popular blogs on the web to smaller websites, you can have the content delivered directly to your Kindle. More importantly, for NovelRank authors, you can have your book or author blog available for your fans and readers, direct to their Kindle! Yes, Amazon charges a small monthly fee ($1.99) to the Kindle user to subscribe to your blog, but 70% of the revenue is shared directly to the blog’s creator (that’s you). So, besides providing a service to your fans, you also are generating a little more revenue for all that brilliant blog content! Excited? Time to learn more. It’s really easy actually. Head to the Kindle Publishing for blogs page. You can’t simply use your Amazon account, and will have to create a new account. You can use the same email address as your Amazon account, but you will need a different password (I don’t know why, it just does). Once your account is created and you confirm your email address by clicking the link that is sent to your email inbox, you will be logged into your new account! Click the ‘Your Blogs’ link in the top-right and add a blog. You will need the RSS feed to your blog, fill out some info, and provide some screenshots, but the entire process should take less than 15 minutes. Once your blog is added, it takes less than 24 hours before it is added to Amazon, and less than 72 hours before it is available in searches on Amazon.com. Then, tell people! If you want to see an example, or you are a Kindle user and want to do a 14-day sample, you can get the NovelRank blog on the Kindle! I wish I could make it free or $0.99, but Amazon is currently setting the prices. 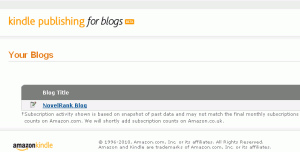 This entry was posted in Tips and Tricks and tagged Amazon, blog, Kindle on December 14, 2010 by Mario Lurig.